Clarkson Frederick Stanfield (1793–1867), Ischia and the Castello d'Ischia, near Naples (1857), oil on panel, 31.4 x 60.9 cm, The Victoria and Albert Museum (Bequeathed by John Jones, 1882), London. Image courtesy of and © Victoria and Albert Museum, London. Many of the best paintings of maritime and coastal scenes have been made by artists with the deep knowledge of the sea which comes from working at sea. Clarkson Stanfield (1793-1867) was well qualified in this respect. With a name as unusual as Clarkson Stanfield, you might have thought that there was no room for confusion. It is thought that his full name was actually Clarkson Frederick Stanfield, but he doesn’t ever appear to have used that middle name. Sometimes, he is incorrectly referred to as William Clarkson Stanfield, which unfortunately is easily confused with his artist son, George Clarkson Stanfield (1828–1878), who painted similar subjects. The father was given the name Clarkson after the slave trade abolitionist, Thomas Clarkson, who was a friend of Clarkson Stanfield’s father. Clarkson Stanfield started his working life on board a coalship, then in 1808 was pressed into service in the Royal Navy. He was discharged in 1814, but the following year sailed on the East Indiaman Warley, where he started to draw frequently. When he returned to Britain, he worked in London as a decorator and theatrical scene painter. In this he was highly successful, working on many large-scale dioramas and panoramas until 1834. In 1830, he toured Germany and Italy, making studies for two moving panoramas of the Simplon Pass and of Venice. He first exhibited at the Royal Academy in 1820, in 1824 was a founder member of the Society of British Artists, and became its President in 1829. He was made a full Academician in 1835. He was also a great friend of the writer Charles Dickens. Clarkson Frederick Stanfield (1793–1867), Mount St Michael, Cornwall (1830), oil on canvas, 153.2 x 244 cm, National Gallery of Victoria, Melbourne, Australia. Wikimedia Commons. Stanfield’s dramatic painting of Mount St Michael, Cornwall from 1830 is, to my mind, one of his finest, and most characteristic. 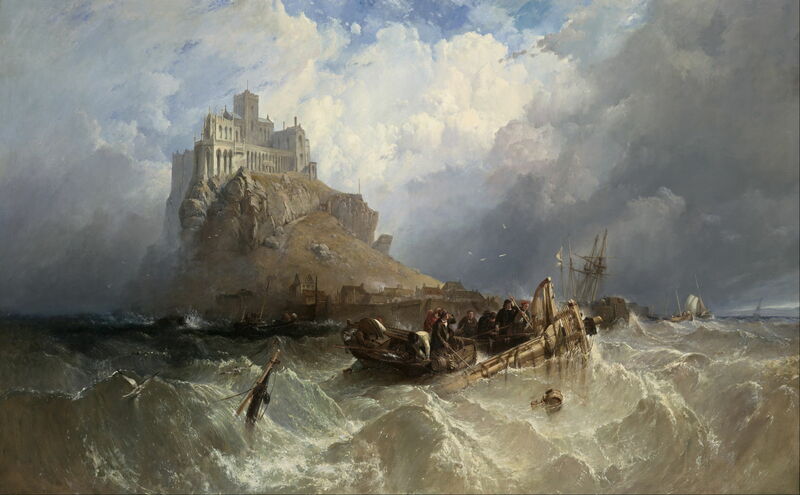 It shows what is now more commonly known as Saint Michael’s Mount, a small rocky island off the coast of Cornwall. Like its sister on the other side of the Channel, it packs a lot of buildings onto its small surface. 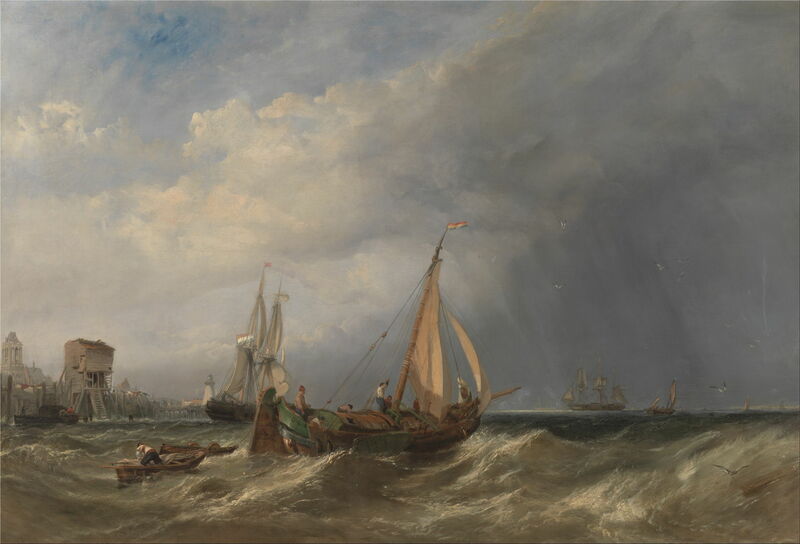 The artist uses several devices which he must have learned as a scenery and panorama painter to inspire maximum awe: the heavy clouds open to blue sky just at the right place to cast the sun’s light onto the buildings, his viewpoint is only just above the short, steep sea, and foreground activity consists of small boats attending to a wrecked ship. For all its melodrama, it is very effective, and very Stanfield. 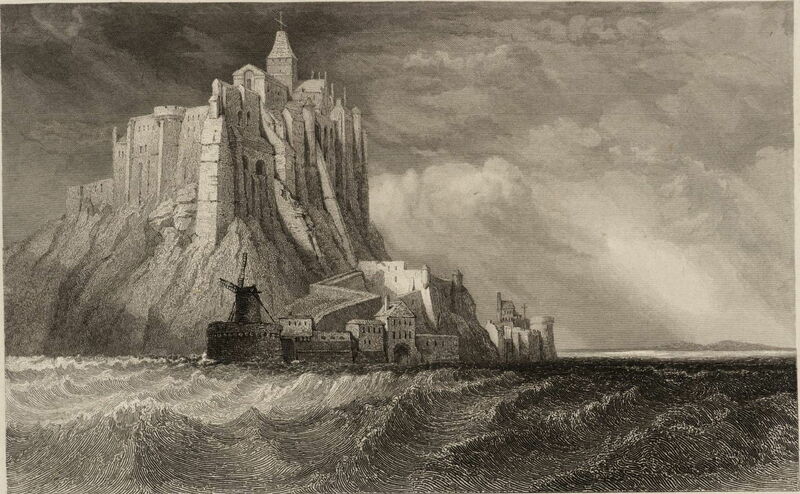 At about the same time, Stanfield made a lower key painting of Mont Saint Michel, on the Normandy coast, which was turned into this engraving of St Michael’s Mount, Normandy, from the West (1836). Another view of his was engraved as The Needles (1836). I know this area well – it is a few miles to the west of us here on the Isle of Wight – and have kayaked in these waters, including passing through a gap in these chalk pinnacles. This engraving appears to be quite an accurate depiction of this landmark at that time, before the famous lighthouse was built. The bay behind the closest chalk pinnacle is Scratchell’s Bay, and the wall of chalk at the back of it forms a huge shield, with the dark veins running exactly as shown here. Stanfield must have painted his original work from sketches made in a boat hove to just to the west of the Needles. 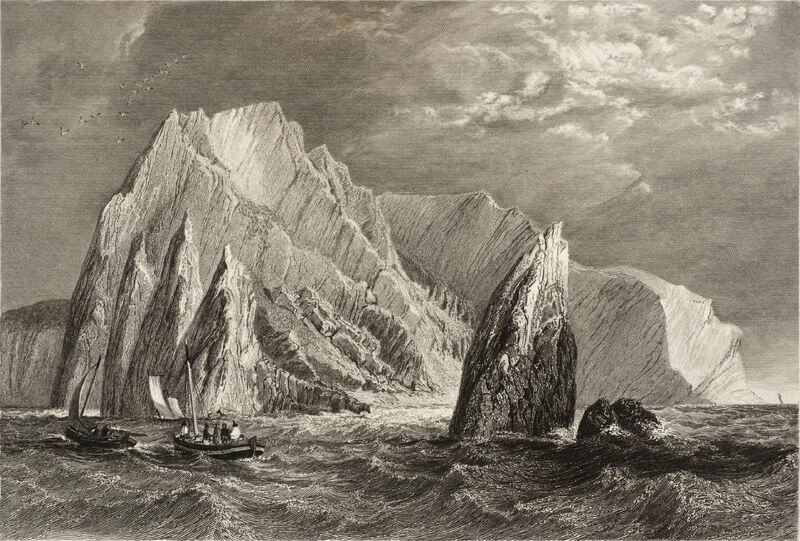 These engravings were published in the successful book Stanfield’s Coast Scenery in 1836. Clarkson Frederick Stanfield (1793–1867), Rotterdam (1838), lithograph after original painting, media and dimensions not known, published in ‘Sketches on the Moselle, the Rhine and the Meuse’ (1838), further details not known. Wikimedia Commons. 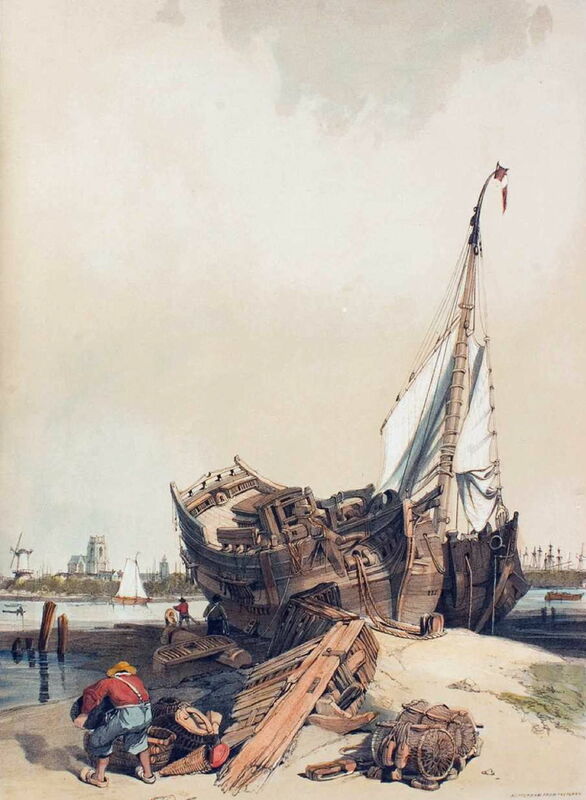 A couple of years later, Stanfield published his more up-market collection of coloured lithographs, Sketches on the Moselle, the Rhine and the Meuse, including this finely detailed view of old hulks at Rotterdam (1838). Clarkson Frederick Stanfield (1793–1867), Sands near Boulogne (1838), oil on canvas, 71.1 x 110.5 cm, The Victoria and Albert Museum (Given by John Sheepshanks, 1857), London. Image courtesy of and © Victoria and Albert Museum, London. Sands near Boulogne (1838) shows a catch of fish being landed on this low and flat section of the coast of northern France. 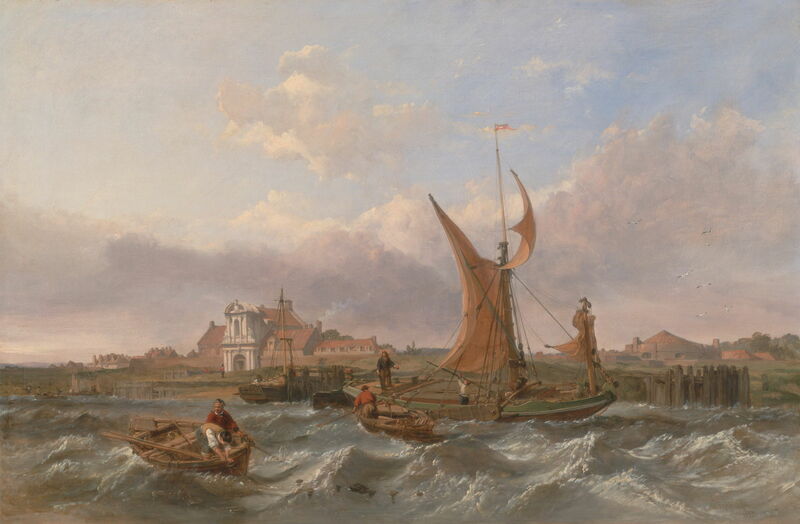 In the summer of 1843, Stanfield toured Holland, finding fresh motifs for his oil paintings, including Oude Scheld – Texel Island, Looking towards Nieuwe Diep and the Zuider Zee which he completed in his studio the following year. Its fragmented clouds are paralleled by the frequent small waves, together building the effect of a brisk offshore breeze. The critics loved it. 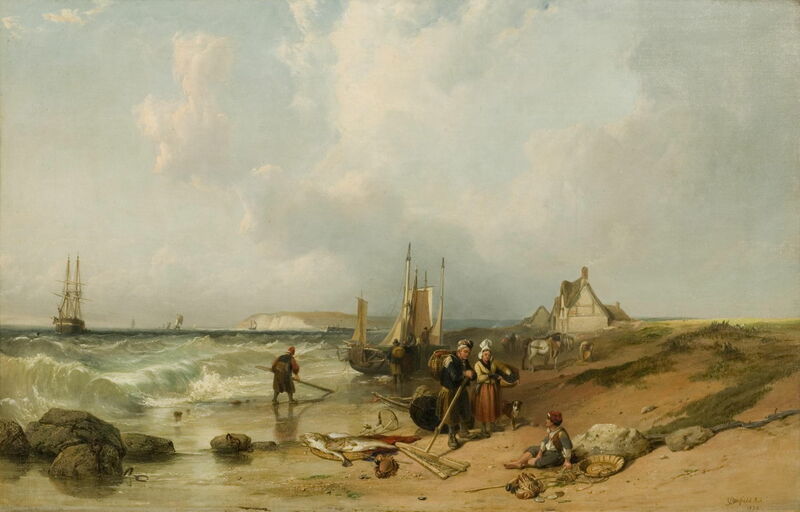 Clarkson Frederick Stanfield (1793–1867), The Seashore at Dover (c 1849), oil on canvas, 42.6 x 62.9 cm, The Victoria and Albert Museum (Bequeathed by Miss E. Anderson), London. Image courtesy of and © Victoria and Albert Museum, London. 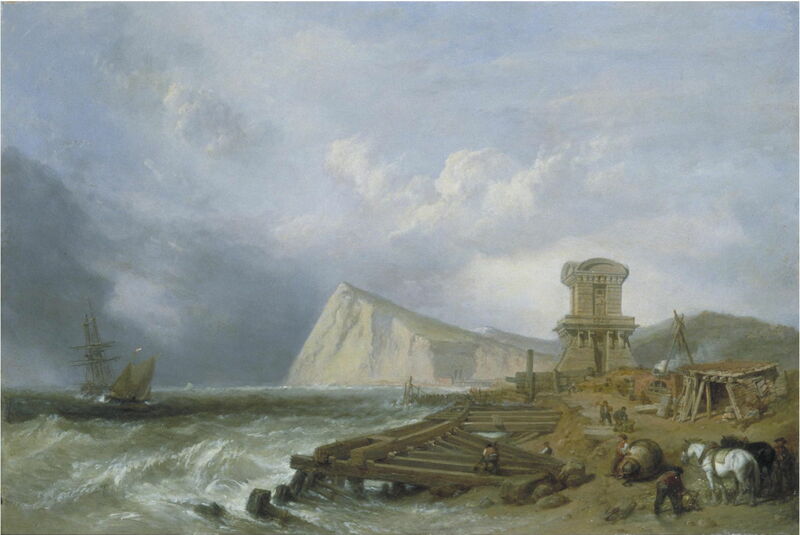 Stanfield painted two versions of The Seashore at Dover in about 1849, one which is now in the National Maritime Museum in London, and this slightly smaller version. It is another windy day, with scattered and blustery showers. The famous ‘white cliffs of Dover’ rise high in the distance, as the wind blows the tops off the small waves in the foreground. The construction work in the foreground relates to the final section of the London to Dover railway, which made travel from England to France much quicker and more convenient. Clarkson Frederick Stanfield (1793–1867), HMS Victory Towed into Gibraltar (c 1852), oil on millboard, 28.9 x 44.5 cm, The Victoria and Albert Museum (Bequeathed by Miss E. Anderson), London. Image courtesy of and © Victoria and Albert Museum, London. 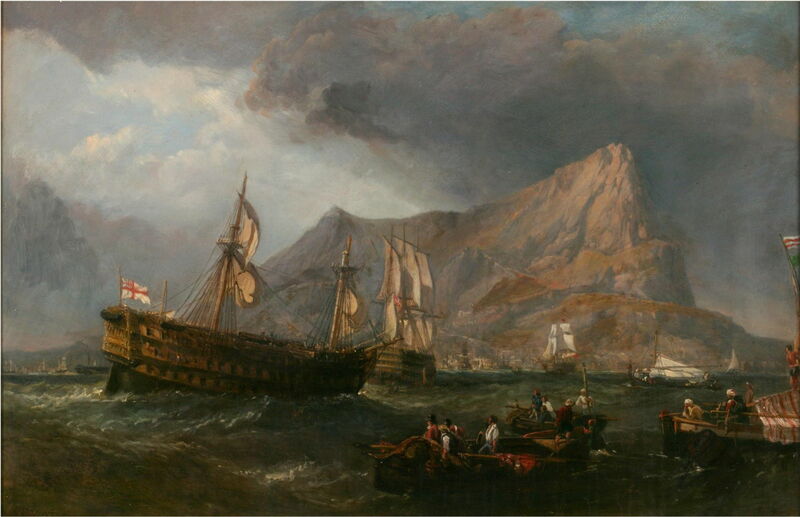 In another of his later works, Stanfield recreates the sad but victorious moment of HMS Victory Towed into Gibraltar (c 1852). This followed the Battle of Trafalgar in 1805, and Nelson’s damaged flagship brought his body ashore at Gibraltar. The rock of Gibraltar behind is dramatised very effectively. I suspect that this painting was intended for the fiftieth anniversary celebrations of Trafalgar. Clarkson Frederick Stanfield (1793–1867), Tilbury Fort – Wind Against the Tide (1853), oil on canvas, 61 x 92.1 cm, Yale Center for British Art, New Haven, CT. Courtesy of The Yale Center for British Art, Paul Mellon Collection. Tilbury Fort – Wind Against the Tide (1853) shows one of the defensive forts which lined the River Thames, here as it opens out into the North Sea by the flatlands of Tilbury in Essex, now a large port in its own right. The weather and sea are typically Stanfield, and the title even explains the mechanism of these short, steep seas. These are commonly encountered when the direction of tidal flow is the opposite of that of the wind. The latter then blows the waves into steeper crests, increasing the difficulties for those in smaller vessels, particularly the fishermen in the small boat in the left foreground. In this case, the tide must be in flood, running from right to left up the estuary, and the wind from the west, blowing from left to right, as indicated by the pennant of the Thames barge. Clarkson Frederick Stanfield (1793–1867), A Dutch Barge and Merchantmen Running out of Rotterdam (1856), oil on canvas, 78.7 x 121.9 cm, Yale Center for British Art, New Haven, CT. Wikimedia Commons. 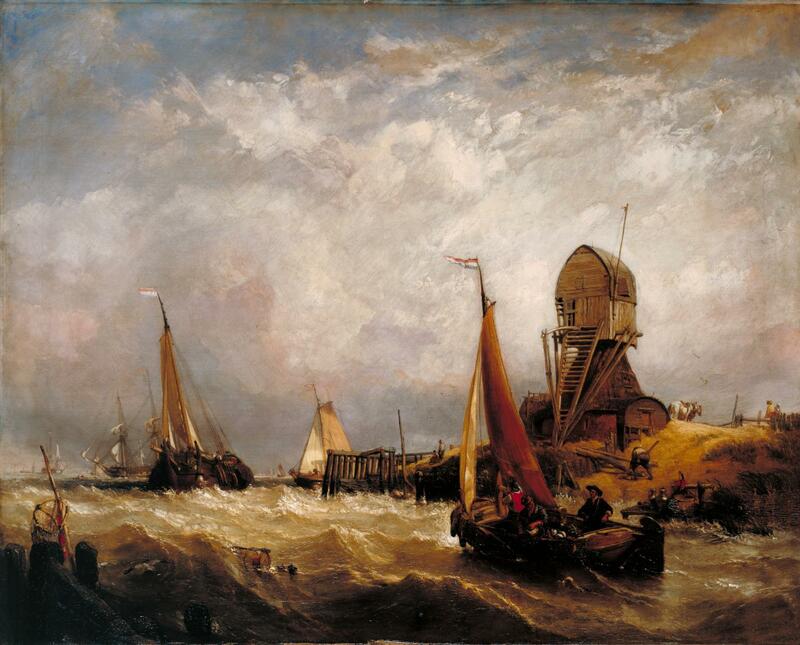 In A Dutch Barge and Merchantmen Running out of Rotterdam (1856), Stanfield has returned to the Dutch coast at Rotterdam, in very similar conditions. Some of the buildings on the seafront are marvellously dilapidated. 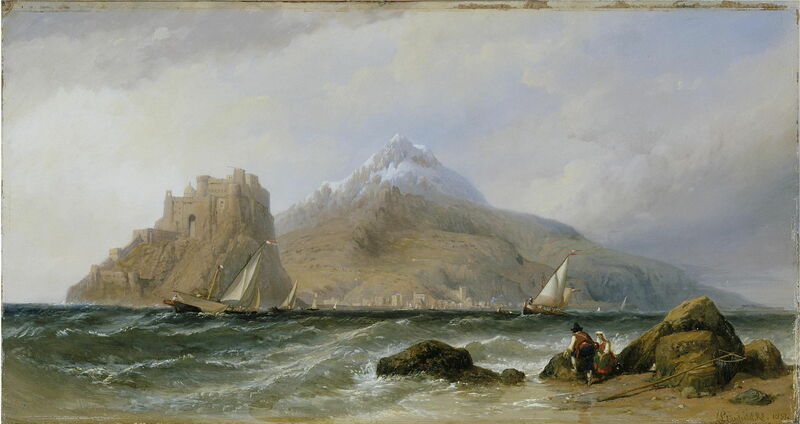 Clarkson Frederick Stanfield (1793–1867), Ischia and the Castello d’Ischia, near Naples (1857), oil on panel, 31.4 x 60.9 cm, The Victoria and Albert Museum (Bequeathed by John Jones, 1882), London. Image courtesy of and © Victoria and Albert Museum, London. Some of Stanfield’s paintings of the continent of Europe are less formulaic. This view of Ischia and the Castello d’Ischia, near Naples, from 1857, shows how subtle he could be when depicting the distant snow-capped mountains of Ischia. 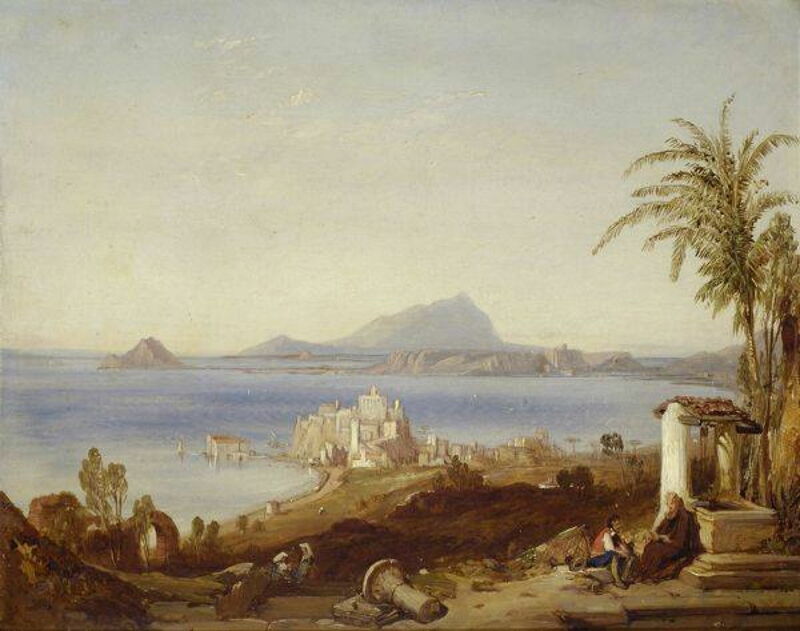 Clarkson Frederick Stanfield (1793–1867), The Gulf of Pozzuoli (date not known), oil on cardboard, 30 x 35.5 cm, location not known. Wikimedia Commons. This undated view of The Gulf of Pozzuoli appears to be one of his few coastal views in which there is not a breath of wind, and the sea is calm. Clarkson Stanfield died in 1867, leaving his son George Clarkson Stanfield to continue the family’s artistic work. Only three years after his death, the father’s memory was honoured with a major exhibition of his work. He has not been forgotten, but like most of the landscape painters of the nineteenth century, his work is today not well known. Posted in General, Life, Painting and tagged coast, Dickens, landscape, painting, Stanfield. Bookmark the permalink.